Rorate is pleased to present this article by the author of Ego Eimi – It is I, Falling in Eucharistic Love, and the editor of the magazine Dowry. To explain the development of Catholic doctrine, we offer an analogy between unfolding Christ’s Holy Shroud and developing Christ’s Revelation. The purpose in each case is to display the full figure of Christ, either visually on the cloth, or doctrinally through magisterial promulgations. On Easter morning then, St Peter, St John and St Mary Magdalene found the empty linens wrapped together in the empty tomb. Some time on that day, they would have taken with them the precious relic. Back home in the Upper Room, with what emotion they would have slowly unfolded the linens, gradually displaying the Master’s silhouette: first His shoulder, then His elbow, now His foot and then His Head... Everywhere, their eyes would meet so many wounds, all endured for their redemption – and ours. 53. The sensus fidei is the form that the instinct which accompanies every virtue takes in the case of the virtue of faith. ‘Just as, by the habits of the other virtues, one sees what is becoming in respect of that habit, so, by the habit of faith, the human mind is directed to assent to such things as are becoming to a right faith, and not to assent to others.’ Faith, as a theological virtue, enables the believer to participate in the knowledge that God has of himself and of all things. In the believer, it takes the form of a ‘second nature’. By means of grace and the theological virtues, believers become ‘participants of the divine nature’ (2 Pet 1:4), and are in a way connaturalised to God. As a result, they react spontaneously on the basis of that participated divine nature, in the same way that living beings react instinctively to what does or does not suit their nature. These authoritative quotes from a theological document published by the Holy See as recently as 2014 may surprise for their boldness. They stress clearly that the undiscriminating acceptance of any doctrine is not Catholic. On the contrary, genuine worship of Christ as Truth Incarnate leads every believer to assess what is presented as truth, even when uttered by those acting in Christ’s name. The touchstone of orthodoxy is continuity with what has always been professed and believed in the Church of Christ: ‘For the Holy Spirit was promised to the successors of Peter not so that they might, by his revelation, make known some new doctrine, but that, by his assistance, they might religiously guard and faithfully expound the revelation or deposit of faith transmitted by the apostles’ (Vatican I, Pastor Aeternus, Chapter 4). Which stain bore Simon’s name? It could not be less than three, one for each denial – and so many more... In St Peter’s soul, contrition connected the reddish shapes of various sizes like the stars under which he was reborn, as in a new constellation named Absolution. It was probably no surprise to Simon then, when he became aware of Christ’s bodily presence, standing at the other end of His unfolded Shroud. The contrite Vicar had opened his soul to the Saviour already. Christ confirmed His pardon and left, until they met again by the Sea of Galilee. His Vicar remained on his knees looking across the bloodied sheet, while on either side of the table of redemption hundreds of men materialised, imitating his posture: his successors. What were there names, their races and languages: Clement, Anacletus, Alexander, Fabian, John, Stephen, Pius, Leo, Gregory, Benedict... Francis? How many of them would the Fisherman have until Christ’s glorious return? The Lord would not fail to assist them, as He had done for him, that each might be faithful: ‘But I have prayed for thee, that thy faith fail not: and thou, being once converted, confirm thy brethren’ (Luke 22:32). Presently, Peter felt her hand gently resting on his shoulder. No nail had pierced that hand, but a sword had pierced the immaculate heart of the Mother who, standing behind him, silently assured forgiveness to the kneeling penitent, and promised assistance to Her Son’s first Pope, now rising. Within fifty days, She would be with Peter and the ten others in this very room, when the Holy Ghost would be sent upon them, turning every believer into an ‘epistle of Christ... written not with ink, but with the Spirit of the living God; not in tables of stone, but in the fleshly tables of the heart.’ (2 Co 3:3). How long would the unfolding of Christ’s Revelation take, until His return in might and glory? A few years; a few centuries; or millennia? One thing was certain: all that was ever to be proclaimed through dogmatic promulgations in the ages to come was already lying there, before Simon’s tearful eyes, spread across the linen cloth of the Risen One. 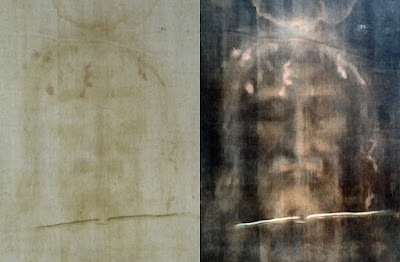 His message was imprinted on His Shroud: apparently flat, but unfathomably deep if measured in mercy – transcendentally high if gauged with joy.